Paul Matuszak — a Mercer consultant, father, and avid marathon runner — shares a peek into his week. 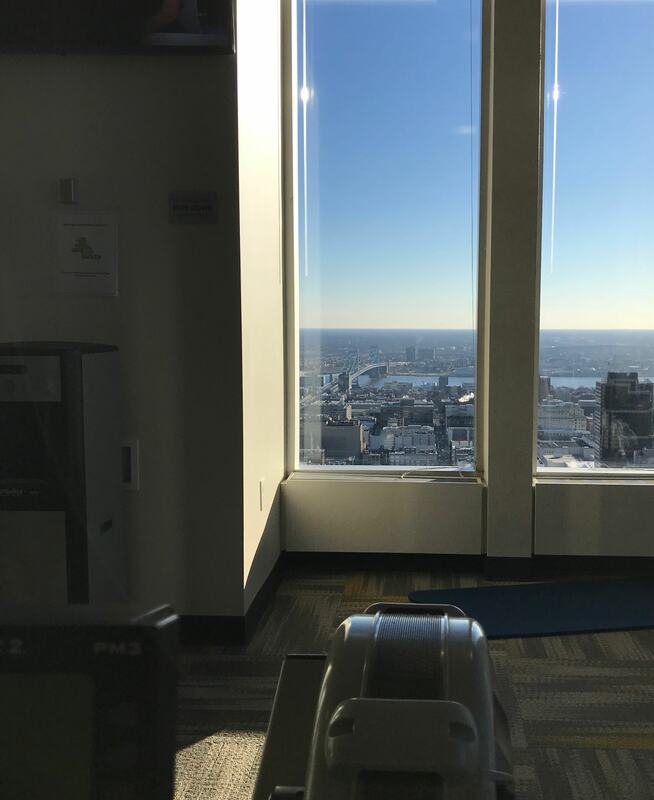 By Mary Clare Fischer·	 1/24/2019, 8:00 a.m.
What I do: Healthcare benefits consultant for a large firm called Mercer. 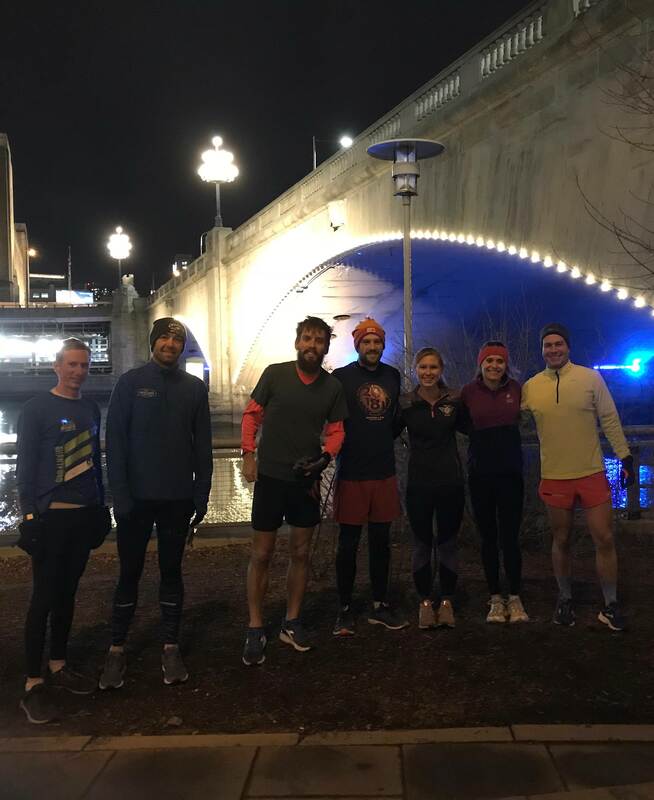 What role healthy living plays in my life: I am a longstanding member of a local group called Philadelphia Runner Track Club. In 2018, I competed in two of Philadelphia’s biggest running events, placing 18th at the Broad Street 10 Miler in 50 minutes and 35 seconds and 10th at the Philadelphia Marathon in two hours, 22 minutes, and 32 seconds. My goal for 2019 is to hit the United States 2020 Olympic Trials qualifying time of two hours and 19 minutes in the marathon. 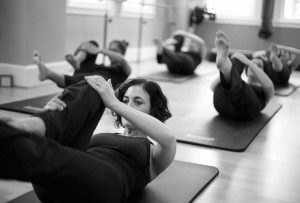 Health memberships: I pay $25 per month to access a gym in the same building as my office. 4:15 a.m. — When my nine-month-old son Brennan wakes up to eat, I decide to start the day. I work from home until 5:45 a.m., then head to the basement to use my rowing machine before my two-and-a-half-year-old, Paul, wakes up. Get in 16,000 meters in a little over an hour. 8 p.m. — I leave for work to begin what I call my daily walk/bike combo — walking about half a mile to the Indego bike share station near my house, biking 2.5 miles to another bike share station near my office, and then walking a quarter mile to work — and eat a vanilla yogurt with frozen bananas in it on my way. 8:28 a.m. — Arrive at work and eat breakfast number two: a peanut butter and jelly sandwich. I’ve also stashed a granola bar to eat later this morning. 12:11 p.m. — It’s a minor mental win to make it to noon before eating lunch. Today is a success. I have chicken and white rice, leftovers from this past weekend. 2:51 p.m. — A coworker has some treats in a dish by her desk, and I grab a pack of Whoppers before my 3 p.m. call. 4:32 p.m. — I eat some oatmeal after my call to get a snack in before running home. 5:50 p.m. — What’s supposed to be a 40-minute run turns into a close-to-90-minute one (12 miles) once my wife, Meg, texts me that she’s not going to be home (with kids in tow) for a while. I even log more than half my run with the Philadelphia Runner Track Club. When I get home, I eat the remains of a slice of pizza before showering. 8:15 p.m. – I make “waffles” out of Play-Doh with Paul while eating a sandwich with leftover frozen meatballs and stealing some of his Cinnamon Toast Crunch. After the kids fall asleep, we watch TV while sipping on some Coors Light and head to bed a little after 10 p.m.
4:18 a.m. — Paul flips on the light and is ready to play, but we fall back asleep until 5:30 a.m. I eat a blueberry biscuit bar to put something in my stomach before the run into work. 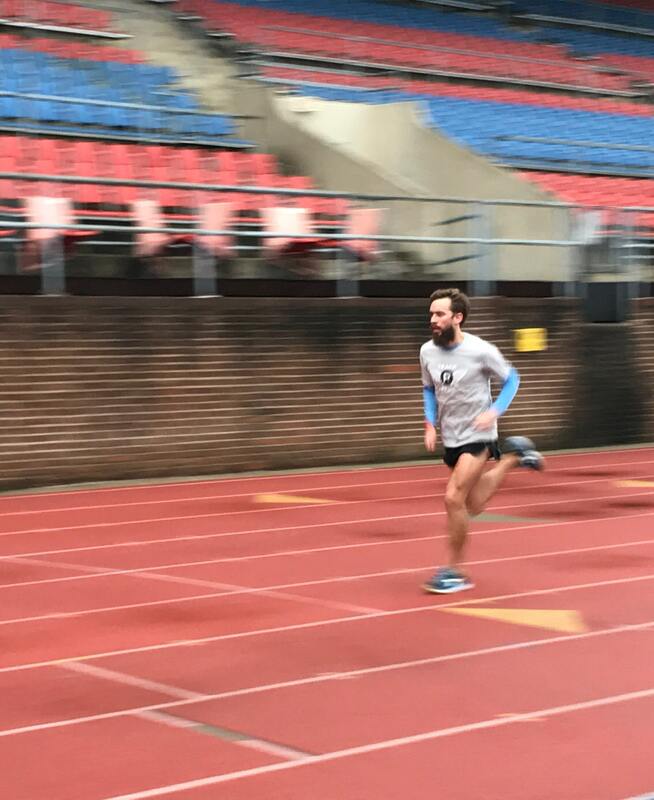 Today, it’s a four-mile warm-up to Franklin Field; four miles with a one-minute recovery in between; 4×200 meters with a 200-meter jog; and a four-mile cooldown ending at the office for a total of 13 miles. 8:30 a.m. — Get to my desk and have oatmeal with banana for breakfast number one. 12:10 p.m. — Miss breakfast number two because of an 11 a.m. meeting, but free lunch is provided afterward, so no complaints! Grilled chicken pita/wrap type of thing with a side salad of greens, other vegetables, and pita bread broken up as a crouton substitute. 1:01 p.m. — Running late for my 1 p.m. — but not late enough to skip the Whoppers dish. 2:06 p.m. — Going for the turkey lunchmeat on a roll I initially packed for lunch today. 3:36 p.m. — Hunger is catching up to the mileage the past two days, so I purchase a bag of pretzels from a vending machine and dip into the peanut butter I keep at my desk. 5:20 p.m. — Leave work to begin my combo walk/bike home! 6:18 p.m. — Meg has made pulled chicken in the crock pot with salsa. I dig into four tacos with chicken and white rice and scoop up the overflow with tortilla chips. The rest of the night involves working while also helping to get the kids ready for bed. 9 p.m. – Small bowl of Cinnamon Toast Crunch for dessert before heading to bed at 9:30pm. 6:09 a.m. — No time for a workout this morning; need to play with the Paw Patrol fire truck and spend time getting presentable for work as I’m meeting with a client first thing this morning. I still do my typical walk/bike combo to work. 9:10 a.m. — Breakfast is provided for my meeting, and I snag a bagel, a bowl of mixed fruit, and potatoes. 11:30 a.m. — Grab a second helping from the fruit bowl! 1:50 p.m. — Meeting continues over lunch, which was offsite. Eat salad with lots of things on it, only three of which I could identify — grilled chicken, Brussels sprouts, and kale — served with a small roll. 4:05 p.m. — Meeting over, and I chow down on a pack of peanut butter crackers I threw in my bag in this morning. 5 p.m. — Leave work for bike/walk combo home. Dinner is just before 6 p.m. and is exactly the same as Tuesday — leftovers! Then catch up on missed work emails from today. 8:30 p.m. — Bowl of Cinnamon Toast Crunch. 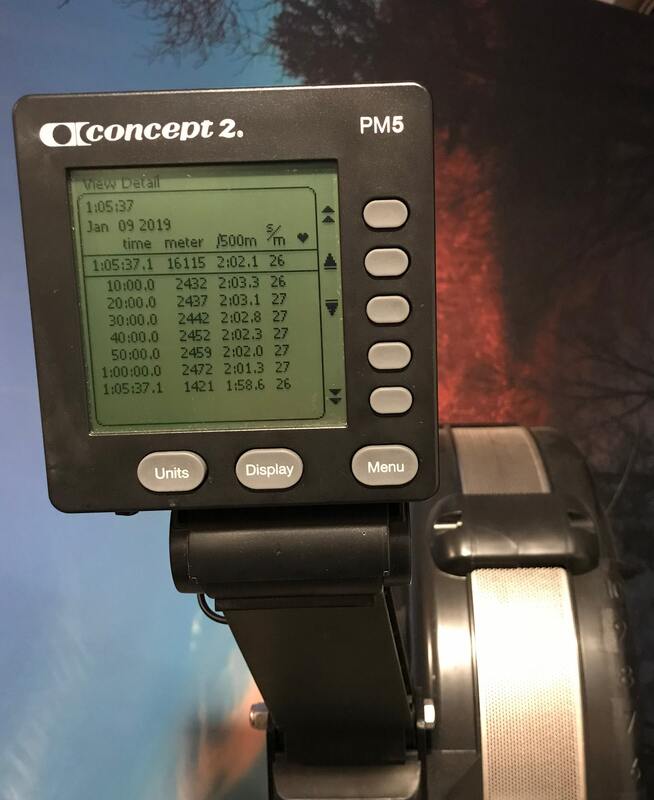 9:05 p.m. — Easy session on the rowing machine: 16,000 meters in 65 minutes and eight seconds. Finish a yogurt I see covered in plastic wrap in the fridge before going to bed at 11 p.m.
5:39 a.m. — Paul wakes me up, and we head downstairs. I eat a leftover piece of scrapple while I multi-task work and playing “pizza party” with Paul. 8:40 a.m. — One slice of toast, two slices of scrapple, two eggs. Meg is sick, so I use PTO and limit work to keep Paul occupied. Workout number one of the day is a third-of-a-mile walk to Target with Paul and then managing a walk home with a full backpack, seven bags hanging on my left arm, and Paul’s hand in my right hand. 10:30 a.m. – Bag of trail mix before workout number two: a trip to the Dickinson Square Park playground. Paul is really into saying, “Ready, set, go” before sprinting from one end of the playground to the other end. So we do a lot of those dashes, despite really cold and windy weather. Noon — Yogurt and banana with peanut butter on a slice of bread. 2:05 p.m. — Paul is napping, so this is my opportunity to get my run out of the way. 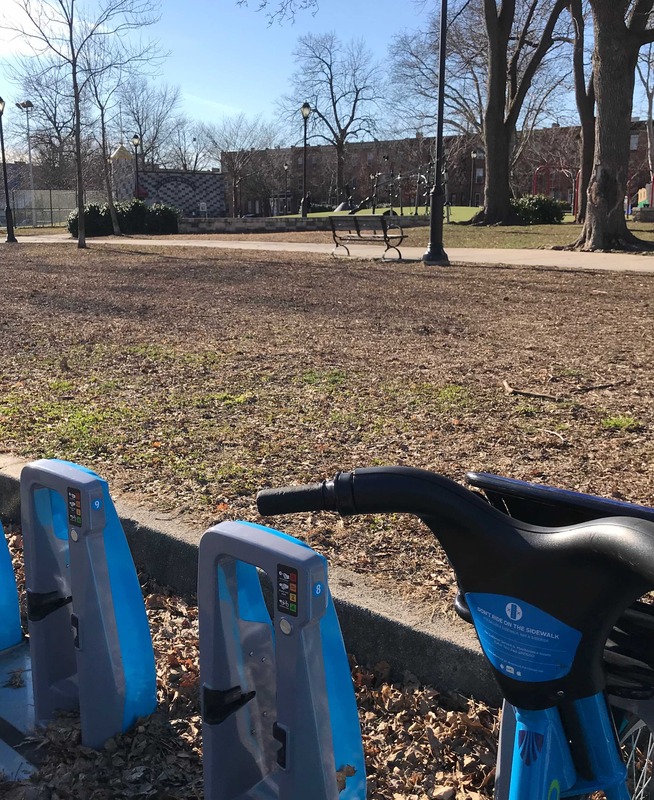 Eleven miles with a quicker paced segment in the middle, consisting of four miles with a two-minute recovery halfway through. A handful of peanuts when I return and knock out some work-related tasks. 5:45 p.m. — Pierogis with onions and a side of pasta with cheese and bread crumbs (fancy homemade version of mac and cheese). 9 p.m. — Kids are asleep and house is “clean.” Chips, popcorn, Coors Light, Victory Brewing Company HopDevil IPA, and re-runs of The Office before falling asleep at 10:30 p.m.
2:55 a.m. through 4:30 a.m. — Brennan is awake, which means so are we. By the time 4:30 rolls around, I get hungry enough to grab a small bowl of Rice Chex cereal. At this point, it’s not worth going back to sleep since I need to leave work by 2 p.m. to fulfill volunteer assistant coach duties for Archbishop Ryan High School’s track and field team. So I start to work from home. 5:35 a.m. — It’s the second straight day Paul wakes up before 6 a.m. and the third straight before 7 a.m. Meg and I CHUG coffee. 8:30 a.m. — I walk/bike combo to work while eating a cinnamon raisin bagel, then knock out 8,000 meters on the rowing machine. Despite not knowing where it came from, I grab a soft pretzel from my office’s kitchen before beginning work round two. 1:05 p.m. — Peanut butter and banana sandwich on whole wheat bread. 3 p.m. — Homemade mac and cheese leftovers before leaving for the track meet, held at Haverford College. 5:10 p.m. — Have enough time for a six-mile easy run around the campus’ nature trail and outdoor track before heading indoors for the 6 p.m. meet. Eat peanut butter crackers in the little time before the races start. 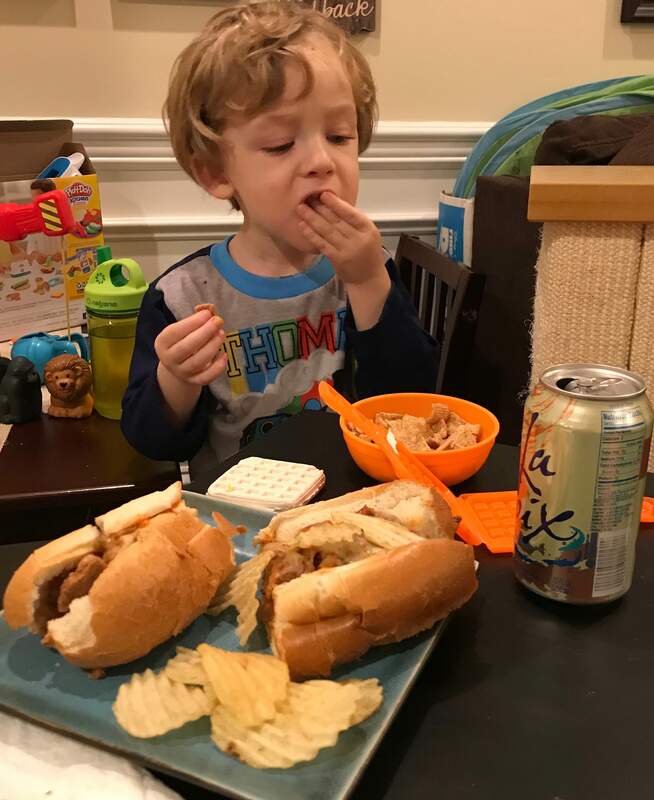 9:30 p.m. — Arrive back home and dig into all kinds of leftovers, including a half slice of pizza, a quarter of a cheesesteak, one large onion ring, breakfast potatoes, and a piece of pork roll.